We played tourist with my parents and sister on Saturday. 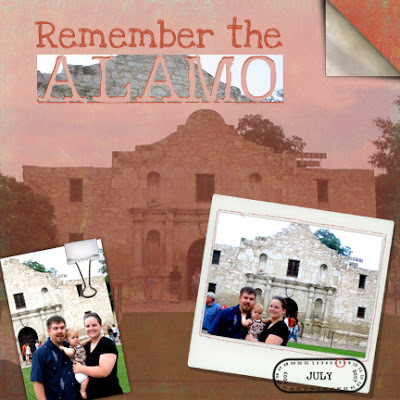 We drove down to the Alamo and Riverwalk...walked around and had a great dinner. It's kinda strange that this is the place we take people now when they come to visit. It's not the Arch or Busch stadium anymore. It just feels kinda strange. We're enjoying it though. Still LOTS to do to get the house liveable but we're coming along! On the way back home my mom captured this image of Naomi in her car seat. She was sucking on her dolls foot with hers in the air. It's such a funny picture. I had to put it in a scrapbook page and include the one where she's actually sucking on her own foot! Enjoy. Thanks for looking!